Lovely to receive from a university chancellor this fancy invitation -- to a Distinguished Faculty Lecture by an IntLawGrrl! 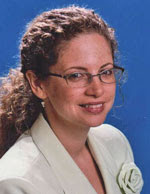 In this case, the lecturer is Karima Bennoune, named the 2010/2011 Chancellor’s Distinguished Research Scholar at Rutgers University, Newark. Karima (left) is Professor of Law, Arthur L. Dickson Scholar, and director of the Global Legal Studies Center at that university, where she teaches courses in public international law, terrorism and international law, international women’s human rights, and international protection of human rights. IntLawGrrls' posts by and about Karima may be found here. 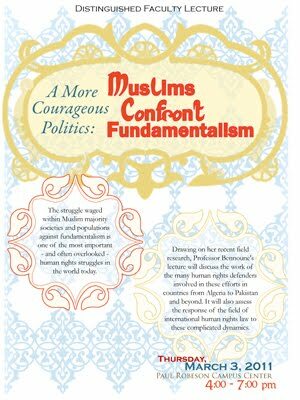 She will receive the chancellor's award and give an address entitled "A More Courageous Politics: Muslims Confront Fundamentalism" at 4:30 p.m. Thursday, March 3, at the university's Paul Robeson Campus Center, 350 Martin Luther King Jr. Boulevard, Newark, New Jersey. Details here.